Hemoglobin (Hb) is a hemeprotein with two linked pairs of globin chains. Each chain is connected to a heme residue in its center. Hemoglobinopathies are divided into quantitative and qualitative defects in globin synthesis. Hemolysis is a pre-analytical problem that reduces quality of sample for measurement of many analytes. Blood samples from 311 female and 189 male subjects with normal and abnormal Hb electrophoresis patterns were studied. Three milliliters of whole blood was obtained from all subjects and transferred into EDTA tubes. To analyze hemolysis, 1.5 ml of blood from each tube was aliquoted and frozen, and the remaining blood was stored at 4 °C for 24 h. Hemoglobin was measured in both hemolyzed and non-hemolyzed samples by capillary electrophoresis. Data was analyzed with linear regression. The results were linear for the lower limit of detection of 9, 0.5, and 0.1% up to at least 99.5, 6.6, and 99.4% for HbA, HbA2, and HbF, respectively. Method comparison demonstrated good agreement between non-hemolyzed and hemolyzed conditions for hemoglobin measurement. Use of hemolyzed samples had no effected on hemoglobin measurements. Hemoglobin is a hemeprotein with two linked pairs of globin chains. Each chain is bound to a heme residue in its center. Hemoglobin molecules are in red blood cells (RBCs) and regulate O2 and CO2 concentrations in tissues. Structural differences in the globin chains account for the different hemoglobin types in circulating blood. In normal adults, hemoglobins include HbA (α2β2), HbA2 (α2δ2), and HbF (α2γ2), accounting for 95–97.5%, 1.5–3.5%, and up to 2% of total hemoglobin, respectively (Iyer et al. 2015; Greene et al. 2015; Kohne 2011). Hemoglobinopathies or hemoglobin disorders are common genetic diseases that have an autosomal recessive inheritance pattern. Hemoglobinopathies are divided into quantitative and qualitative defects in globin synthesis. Quantitative defects lead to thalassemia syndromes, often with normal globin structure. Qualitative defects lead to hemoglobin variants with point mutations in globins (Kohne 2011; Payandeh et al. 2014; Brancaleoni et al. 2016). Laboratory diagnoses of hemoglobinopathies are based on complete blood count (CBC) results and hemoglobin measurement by syan-methemoglobin, electrophoresis, and chromatography. Red blood cell morphology varies from normochromic normocytic to hypochromic microcytic, and hemoglobin concentration can reduce or normal (Kohne 2011). In clinical laboratories, various errors may occur pre-analytically, analytically, and post-analytically. Lack of awareness of these errors can lead to confusion in diagnosis and treatment; therefore, identification of the potential error source is required to prevent it. Most laboratory errors are pre-analytical (32–75%). Pre-analytical errors include patient identification errors, inappropriate sample collection, poor sample quality, wrong transfer of sample, and others (Marin et al. 2014; Plebani and Carraro 1997; Tapper et al. 2017). Hemolysis is a pre-analytical problem that reduces sample quality for measurement of many analytes. In hemolysis, RBC membranes are destroyed and their contents released. Hemolysis can occur due to disease, centrifugation, prolonged storage on ice, and other causes (Ji and Meng 2011). The aim of this study was to determine the effect of hemolysis on hemoglobin measurement by capillary electrophoresis. Blood samples were obtained from Pardis clinical laboratory between December 2017 and April 2018. Samples from 311 female and 189 male subjects with normal and abnormal Hb electrophoresis patterns were studied. Three milliliters of whole blood was obtained from all subjects in EDTA tubes. To hemolyze the samples, 1.5 ml from each tube was removed and frozen for 24 h. The remaining 1.5 ml of non-hemolyzed blood was stored at 4 °C for 24 h. After 24 h, hemoglobin was measured in both the hemolyzed and non-hemolyzed samples by capillary electrophoresis. Sebia 2-flex piercing capillary electrophoresis was used to evaluate the hemoglobin. The instrument was fully automated, and Hb was measured using a Hemoglobin(e) kit purchased from the instrument manufacturer. In this method, an electrical field is established and the charged hemoglobins are separated by their electrophoretic mobility. Separation occurs according to the electrolyte pH and electroosmotic flow. The electrical charge of each hemoglobin depends on its structure (Jenkins and Ratnaike 2003). Hemoglobin in hemolyzed and non-hemolyzed samples was measured at 415 nm. Before analyzing the samples, normal HbA2 control blood from Sebia was used for internal quality control. Data were analyzed by linear regression with SPSS16 software. The detection limits and number of samples are given in Table 1. The method was linear for HbA (y = 0.9986x + 0.3331, R2 = 0.9984), HbA2 (y = 0.9843x − 0.0851, R2 = 0.9796), and HbF (y = 1.0081x − 0.2448, R2 = 0.9984). 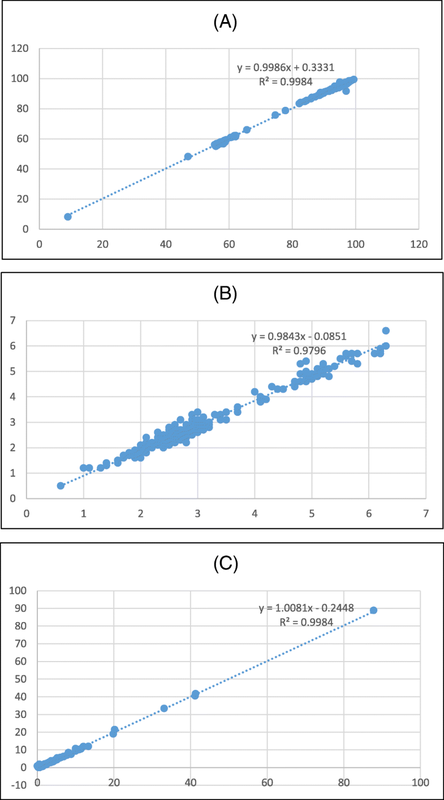 Regression analysis is shown in Fig. 1. The coefficient of variation (%CV) in internal control for 50 different runs (between run) was 2.9%, and acceptable values were up to 3.5%. According to these results, method comparison demonstrated good agreement between non-hemolyzed and hemolyzed samples for HbA, HbA2, and HbF. Because the Sebia system uses hemolysate solution and RBC membranes are destroyed, it seems hemolysis has no effect on hemoglobin measurement. Capillary electrophoresis is an accurate instrument for screening and diagnosing hemoglobinopathies. Recently, the FDA recommended using capillary automated system even in routine laboratory diagnoses (Keren et al. 2008; Lippi and Plebani 2016). Hemoglobinopathies are generally analyzed by capillary electrophoresis in reference laboratories. Other labs send their samples to these centers. Usually, sample hemolysis is due to inappropriate sampling or transferring. The risk of sample hemolysis is increased in laboratories that do not perform the test and send it at low temperature. One concern is that sample quality will be reduced during the transmission. Therefore, the aims of this study were to determine the effect of hemolysis on sample quality and finally hemoglobin measurement. This assay demonstrates excellent linearity and good agreement between non-hemolyzed and hemolyzed samples. Thus, hemolysis has no effect on hemoglobin measurement and use of hemolyzed samples to measure hemoglobin patterns does not lead to erroneous results. This study has been supported by Pardis Clinical and Genetic Laboratory, Mashhad, Iran, and hereby, we acknowledge all persons attending in this research. All authors declare they have no conflicts of interest. We have no funding for this article. This data will be shared to clinical laboratories to measure Hemoglobin electrophoresis by capillary electrophoresis with pre-analytical problems. AM contributed in the conception and design, analysis and interception of data, drafting the article, and approved final version to be published. A-RV did the conception and design, acquisition of data, drafting of the article. AA participated in the conception and design, and acquisition of the data. SM took part in the conception and design, and acquisition of the data. FK did the conception and design, revising the article, and approved the final version to be published. All procedures followed were in accordance with the ethical standards of the committee on human experimentation MUMS (Mashhad University of Medical Science). Informed consent was obtained from all patients for being included in the study.